differencemakers community blog: What are you doing that is truly different that is highly valued by your customers/clients? What are you doing that is truly different that is highly valued by your customers/clients? 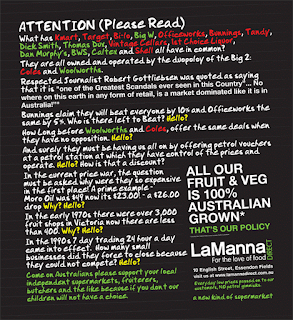 For more than 50 years LaManna has been supplying fresh produce in different ways to the big supermarkets. 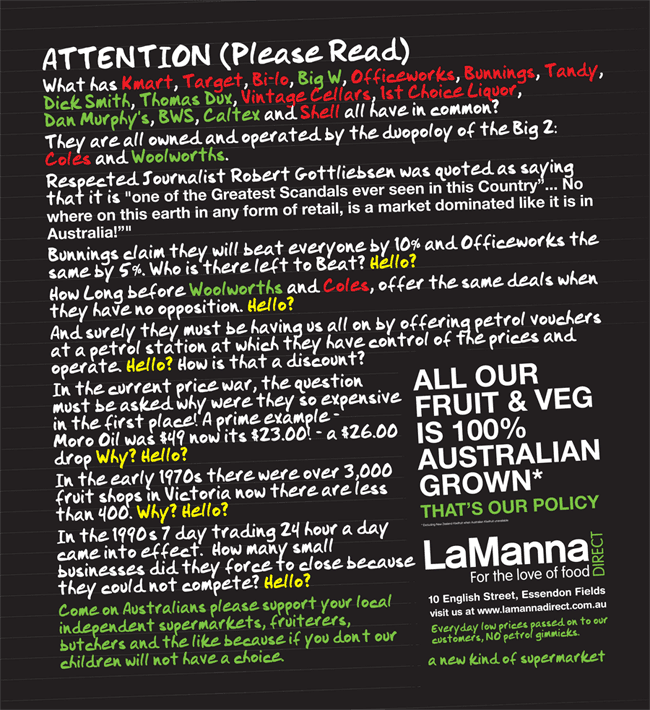 And they don't mind taking it up to the big guys either which in Australia is Woolworths and Coles. Check out the sign below that appears on LaManna's website. I personally prefer to shop at places like LaManna. There is too much status quo for me at the big guys places where shopping is impersonal and increasingly you buy what they've got (their own brands) which more and more I don't want. How much is status quo or normal about what your business offers? And what are the alternative people to you offering your buyers? How often do you ask yourself these kinds of questions about your business? In most advertisements by big business there is a lack of authenticity and a whole lot of BS. And where would Google or Facebook be if the big guys didn't advertise? Are you muting ads on TV like I do and ignoring ads on social media like I do? Authentic differentiation is one way you can stand out from the crowd. What are you doing that is truly different that is highly valued by your customers/clients? I work with passionate people to conceive, instigate and implement the crucial people elements of change programs that actually achieve desired outcomes (research shows more than 70% of change programs fail). Please register for my complimentary webinars on the 7 seven essential willabilities of real leadership here. Presentations that solve your problems. Resources that enable you to make your life simpler. Are you clever or wise? How often do you laugh? I mean really laugh?